Election night (November 1961) - The newly elected Jerome Cavanagh addresses both stunned and jubilant supporters after learning of his upset victory. He had done what they said couldn’t be done. He had caught lightning in a bottle and swept the endorsement-laden incumbent into the dustbin of history. Like the tragic Shakespearean character Julius Caesar, Cavanagh’s zenith would rise to incredible heights and his fall would be just as spectacular. Detroiters Marilyn Donahue and Betty James never met each other in their all too brief and tragic lives but their names would be inextricably linked together in getting a young mayor elected and changing Detroit forever. 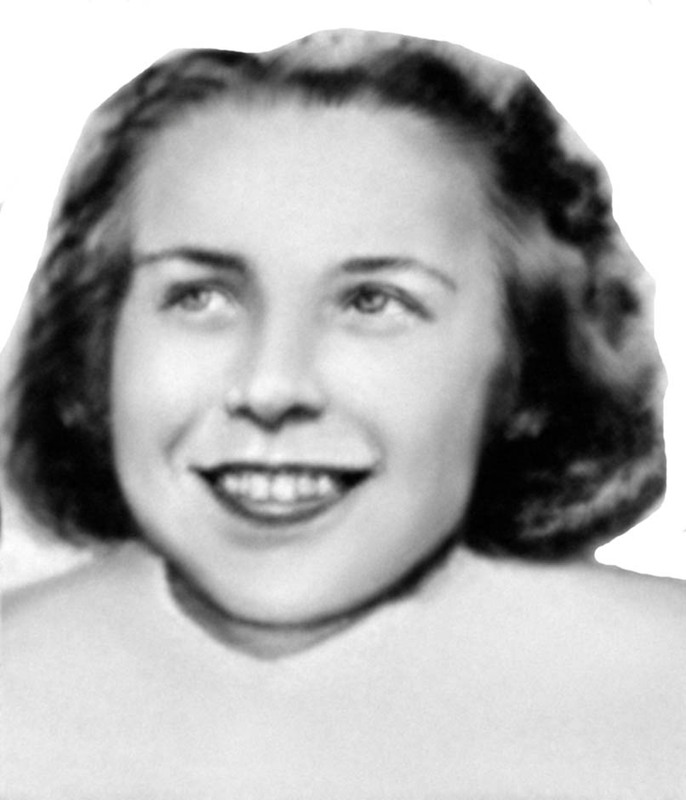 In the winter of 1960 Detroit witnessed a surge of criminal activity which included the brutal murders of Donahue and James. At 8:00 a.m. on the morning of December 7th, the twenty-three year old Donahue was to unlock her place of employment but instead found the door already unlocked. As she walked in she was startled to see a man at her desk who then lunged at her with a knife, stabbing her numerous times. After stealing her wallet he fled the scene. Donahue’s dying description of her attacker revealed he was black, twenty-five to thirty-five years old, 5’5” to 5’8”, and he wore dark, shabby clothes. She recalled that he had been in before looking for odd jobs. Twenty-six year old Betty James, a mother of three, met her fate later in the month when on the 27th of December she attempted to walk the four short blocks from Woodward to Children’s Hospital where she worked. She never made it. She was mugged by a black man who bludgeoned her with a four pound brass bar and then robbed her, fleeing the scene after witnesses sounded the alarm. They described him as a heavyset black man about thirty-five years old and 180 pounds. Betty James died shortly thereafter from massive head wounds. It was the deadliest month in Detroit since 1930 and authorities were unable to explain the dramatic increase in violence. White society recoiled in terror at the violent deaths of such promising young lives. The Detroit News, equally appalled, posted a $5,000 reward for information leading to a conviction in either case. Both deaths received daily front page coverage in the Detroit News and crime tips poured in from concerned, outraged citizens. At Mayor Louis Miriani’s behest, Detroit Police Commissioner Herbert Hart called for a mandatory six day work week for police and an aggressive dragnet was laid down in an attempt to turn the killers. Over 1,000 suspects were interrogated, periodically netting well-respected black citizens. The black community was outraged by the wanton seizure and arrest of “anyone black who wasn’t where they were supposed to be.” Betty James’s assailant, an ex-convict, was eventually arrested. 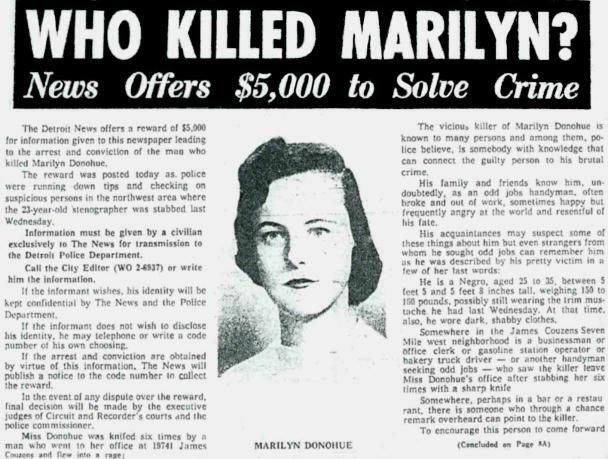 Marilyn Donahue’s murderer was never found. The daggers of 1943 had come unsheathed once again as racial tensions escalated to the point of violence. The sudden death of Mayor Cobo in September of 1957 thrust Common Council President Louis C. Miriani into his office. As is often the case under such circumstances, Miriani received the sympathy vote and was overwhelmingly “reelected” at the end of the year. It must be said of Miriani that he was aware of the smoldering racial problems in the city and like Jeffries, put forth sporadic efforts to set things straight. Also like his predecessors he was put under unyielding pressure by the white majority to tow the segregated line. Detroit Mayor Louis Miriani got caught up in the same predicament that haunted his predecessors: do what was right and create more public housing for the black community or yield to his segregation minded constituents. Initially he tried to please both blacks and whites, an impossibility. Although backed by formidable political machines such as the UAW, the Detroit newspapers and Henry Ford II, he wound up alienating voters in both racial spheres. In the end he followed his constituents and, with the black population now at a viable 30 percent, his decision would cost him the 1962 election. 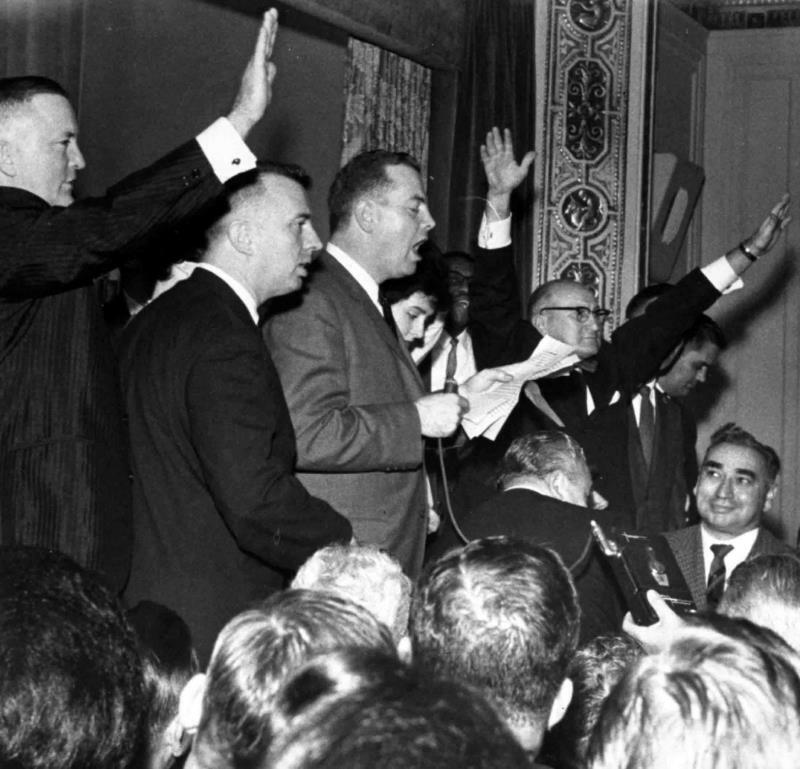 Following the Miriani crackdown, the embattled city now lumbered through the oppressive summer of ‘61, an election year, and the candidates were now lining up around the corner to take shots at the jowly incumbent. One of them was an unknown lawyer, fiercely proud of his Irish heritage and just brash enough to think he could beat the system. He was Jerome Patrick Cavanagh, a native Detroiter who had never run for anything, but with the cloud of discontent hovering over the city, he believed his lack of a political background would actually work to his advantage. The Miriani Crackdown, as this sordid episode became known as, would be Cavanagh’s Excalibur. While Cavanagh lacked experience, there was no doubt the University of Detroit graduate had a sharp mind. He zeroed in on Miriani’s vacillation of the issues, the sorry fiscal state of the city and the racial unrest that kept metastasizing like an unchecked cancer. If elections were decided by endorsements, Miriani would have won in a landslide. He could reel off a host of power brokers who stood behind him. As a result, the phlegmatic Miriani put little effort into campaigning. It was an oversight he would soon come to regret. As the November election loomed, the black community unified for a solution. Now in search of someone to champion their cause, they began an aggressive campaign to oust the incumbent, sporting buttons with the cynical motto “Phooie on Louis.” As luck would have it, a young Irish upstart had entered the race and took his dictums into the black community, espousing long-absent civil liberties and new progressive ideologies. Cavanagh could do no wrong. On election night he was rewarded with a 40,000 vote drubbing of his opponent. Amidst the tumult of the 1960s America found itself in one of the most difficult transitions in its history. Since the tragic fallout of the Civil War, America wandered aimlessly in search for a more progressive and egalitarian society. Jerry Cavanagh was reared during the agony of the Great Depression and like so many others the lean times and the charismatic Franklin Roosevelt made a lasting impression on him. Roosevelt was the hero of the Depression era because he cared about the little guy, a lesson the young Cavanagh took to heart. Detroit’s “boy mayor” entered office at the height of the civil rights movement, taking over a city that LOOK magazine once sardonically rasped “was noted for three things: automobiles, bad race relations and civic sloth.” Such was Detroit’s image in 1961. Cavanagh would thrust Detroit into the national limelight as an exemplar of social progress and tranquility amidst an oasis of public revolt. As one city after another went up in flames during the rebellious 1960s, leaders across the country held Detroit up high as the one city, because of its enterprising young mayor, that would not riot. 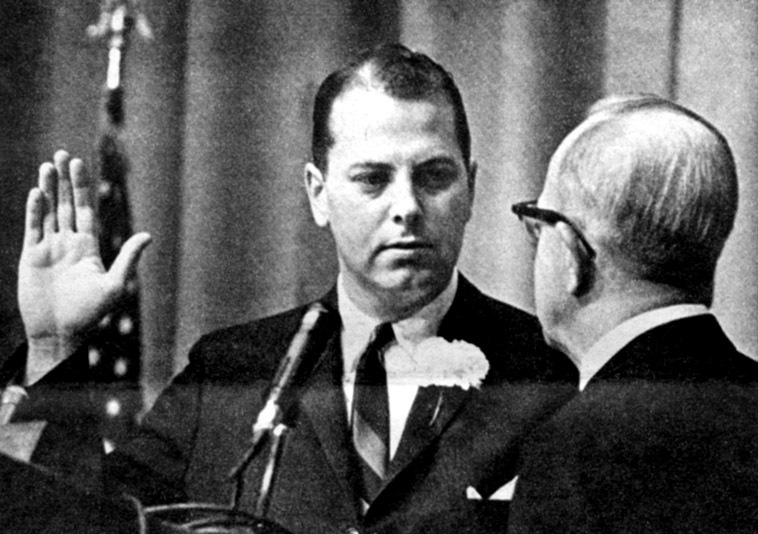 1962 - With the highest hopes of the city of Detroit, Jerome Patrick Cavanagh takes the oath of office at the tender age of thirty-three. A little known lawyer, his stunning upset of the incumbent Miriani sent a message to Detroiters that for the first time blacks had power at the voting booth. Detroit staged a remarkable comeback under Cavanagh. Regarded as a Kennedy type figure, his youth and insight represented the new breed of politician emerging across America. The new $54 million Cobo Hall was already awash in controversy. Intended to regain Detroit’s once vibrant but now flagging convention business, various unions held conventioneers hostage by inflicting their none-too-generous terms upon them. The result, conventioneers took their dollars and went elsewhere. Unlike his predecessor, Cavanagh was free from the foibles of the union because none of them backed him during the election. Henceforth, a system was enacted in which a single union would conjointly assign work with a city administrator present. Union officials were barred from contacting exhibitors. Cobo Hall began to thrive. 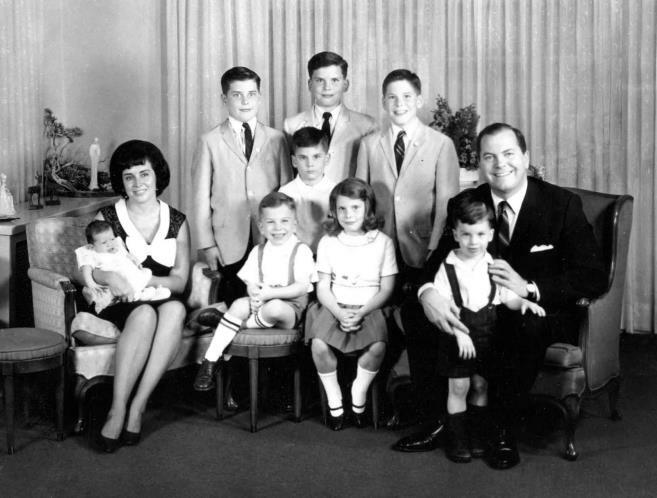 Cavanagh had his hands full upon entering office, and not just with his eight kids. The city was $19 million in the red when Cavanagh took office with the stark reality of a $34 million deficit looming by summer of '62. Cavanagh’s tenure would be closely linked with President Johnson’s Great Society. Johnson’s War on Poverty was aimed at assisting urban children to obtain better housing, health care, education and job opportunities. Cavanagh had already launched a similar program called TAP (Total Action against Poverty). Johnson’s added federal muscle would give TAP some tiger-like teeth to attack with. 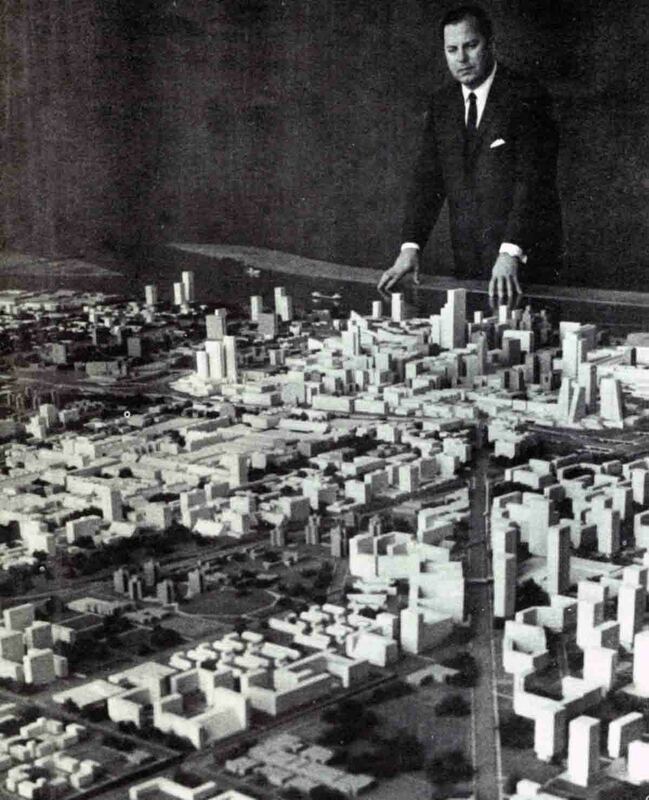 LBJ’s Model Cities Program sprouted up from a rather incongruous kernel. It was the Watts Riot during the summer of ‘65 that shocked Johnson into action. Johnson, like many others, was chagrined by the behavior of black militants. Like no other president before him, he attempted to free the black man from the bondages of poverty and prejudice by passing groundbreaking civil rights legislation, only to see one American city after another ignited by the flame of rebellion. Many whites who were initially sympathetic to the black cause would eventually turn a cold shoulder to civil rights, unable to differentiate between altruist and anarchist. 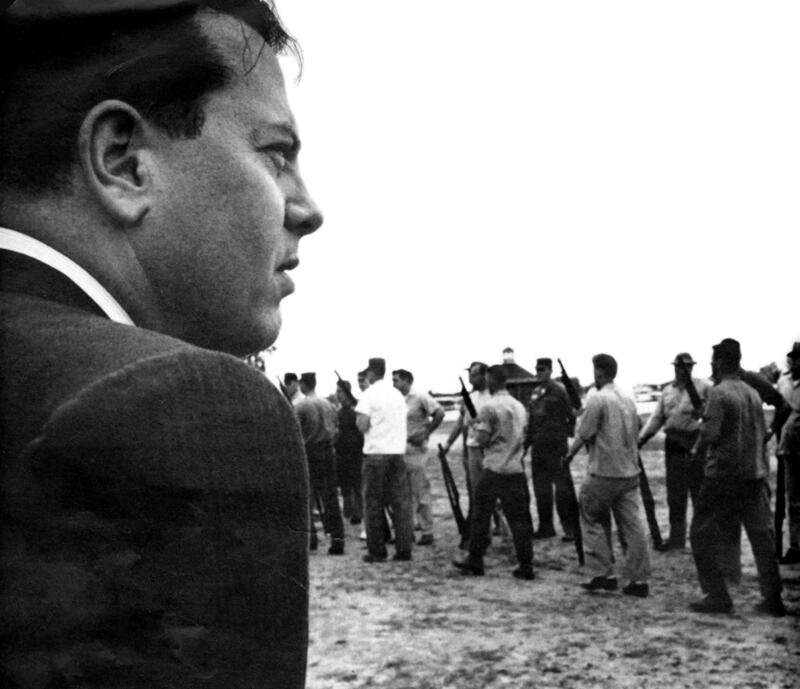 In September of 1965, Cavanagh, along with UAW president Walter Reuther, prodded President Johnson into selecting a pilot city to shower with federal grants and demonstrate to the nation how a large urban area can be rehabilitated physically and socially when properly equipped. Not coincidently, the two gently cajoled Johnson into believing that Detroit would be a good candidate. had to demonstrate their need and have a workable plan to carry out their request. 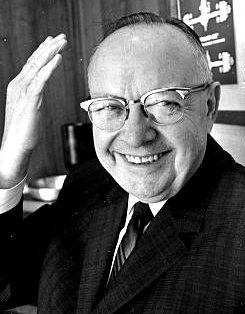 Cavanagh’s persuasive powers and determination enabled Detroit to hustle up some $360 million federal dollars to fuel his anti-poverty programs. Only Chicago, with the powerful Mayor Daley and New York with Mayor Lindsey managed to wheedle more out of Washington. Detroit’s boy mayor was rapidly making a name for himself. Cavanagh had Washington's ear from the onset. 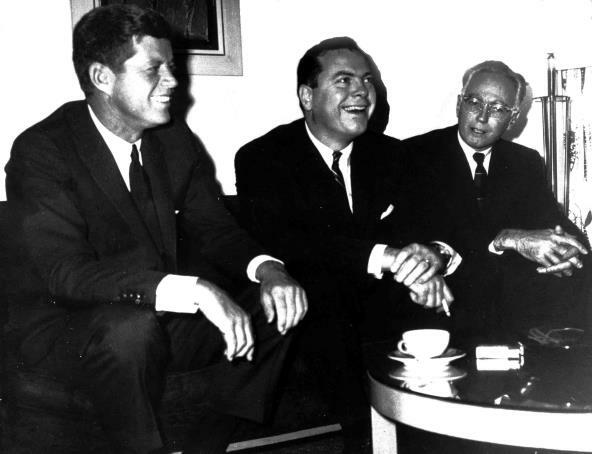 Above, Cavanagh and Detroit Police Commissioner George Edwards pay a visit to the White House and new President John Kennedy. Kennedy's untimely demise would put Cavanagh into the hands of of Lyndon Johnson, a bird of a much different feather. While Johnson lacked the personality of his predecessor he was a giant in the political arena. Johnson needed salesmen for his Great Society programs and Cavanagh was eager to accept the help. But as the Vietnam War raged on through the 60s, Cavanagh would run afoul of LBJ because of his anti war sentiments. 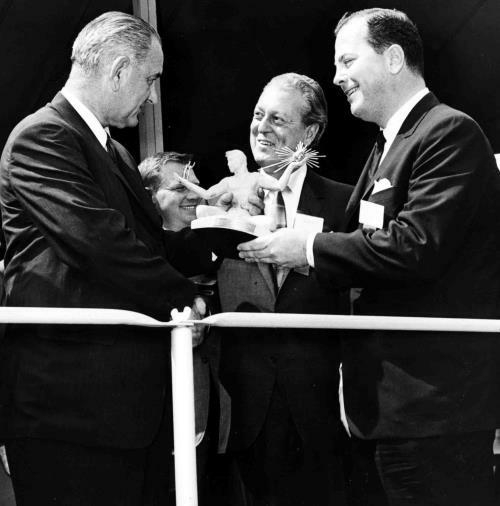 Below, Cavanagh presents LBJ with the Spirit of Detroit, a symbol perhaps reminiscent of Cavanagh's tenure over the troubled city. By 1966 Cavanagh was at his political apex. 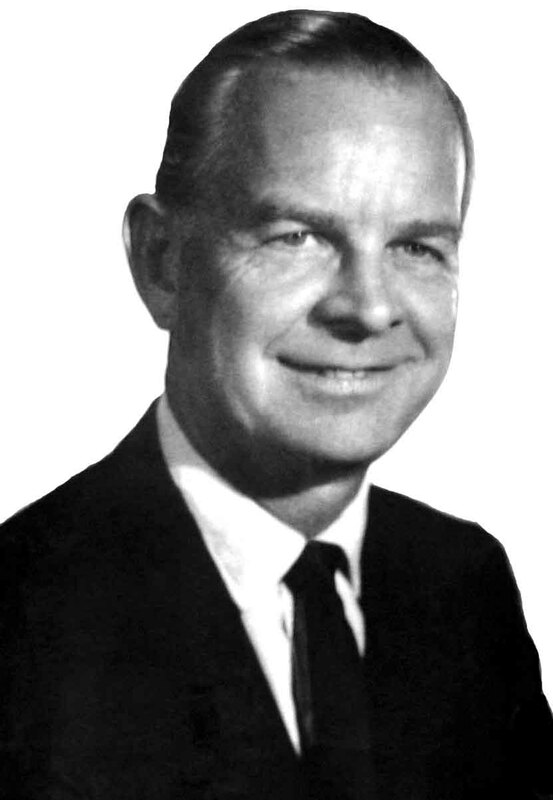 Accordingly he decided to challenge popular former Governor Soapy Williams for the Democratic nomination of Michigan’s U.S. Senate seat in the fall of 1966. 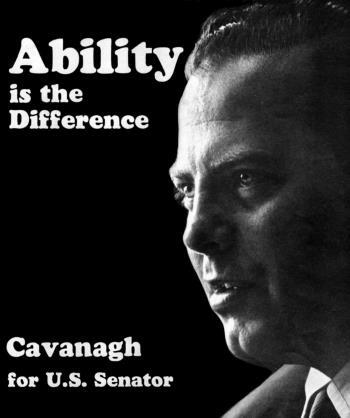 Cavanagh’s name had been bantered about as a potential gubernatorial candidate or possibly even the Irish Catholic successor to JFK. “On a clear day you could see the White House” was the chatter around City Hall. But in the wink of an eye, the dream was vaporized. Williams won in a landslide. Cavanagh was routed even in the black precincts of Detroit which were responsible for his previous success. It may very well have been that Detroiters did not want to lose the popular mayor or they resented him trying to leave. The fresh young face that took Detroit by storm just five years earlier had aged noticeably. It would get considerably worse. Cavanagh’s wife was suing him for separate maintenance, a city council member started a recall petition against him, and in July of ‘67 his city had a date with destiny. For Detroit’s Caesar, the Ides of March had finally come. The view from defeat - A haggard Mayor Cavanagh inspects the ruins of his city after the riot and is confronted by a youth. Cavanagh had no answers for him, nor should he have. He did everything possible to diffuse the time bomb his predecessors had handed him but in the end there were too many fuses and too many sparks to curtail. 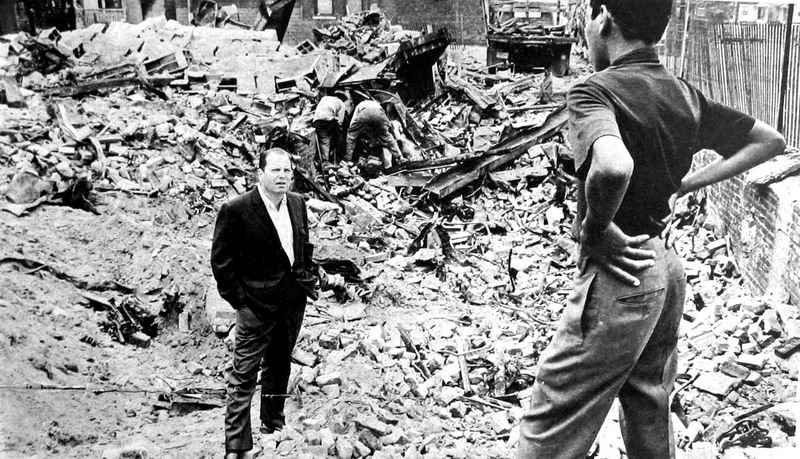 After the conflagration of Watts in August of 1965, big city mayors began preparing for the worst. The Detroit police department’s primary riot busting apparatus for decades were the Commandos. Their ferocious reputation, which was well earned, often caused more trouble than it quelled. Cavanagh knew all about the overly aggressive methods of the Commandos and sought to organize a derivative of them that had the same hardened toughness but was not bent on proving it to society. (Above) Cavanagh watches the newly formed Tactical Mobile Unit (TMU) of the Detroit Police Department drilling on Belle Isle. The special quality differentiating them from the Commandos was that they could absorb physical and verbal abuse (i.e., spitting, rocks, obscenities) without reacting. It was a necessary adjustment in the boiling ghettos across the country that were ignited one after another from routine police incidents that quickly ratcheted out of control. If trouble came to Detroit, Cavanagh believed Detroit would be ready.